Brunch can be a relaxing and rewarding way to celebrate the weekend or to treat yourself to something nice during the week. With so many restaurants that serve breakfast and lunch favorites, it can be tough to find a brunch spot that specializes in that meal in between. Here are three Indy brunch spots that offer their take on delicious brunch favorites. Milktooth is located at 534 Virginia Ave. in Fletcher Place. It is open 7 a.m. to 3 p.m. Wednesday through Monday. The restaurant is closed on Tuesdays. This restaurant is one of the most popular brunch spots in Indy, with nearly 1,000 reviews on popular review sites. The restaurant serves up a balance of breakfast favorites with unique menu items that appeal to refined foodie palates. This includes sorghum soaked bacon, tomato dutch baby pancakes, and grilled cheese with cranberries, truffle honey and a runny egg. This restaurant is very popular, so plan to go outside of the most popular brunch times or expect a wait. 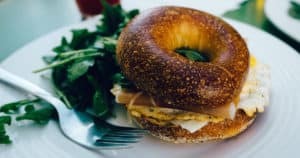 Located at 225 W Washington St. in Mile Square, Cafe Patachou is a New American brunch cafe with reliably delicious food. It considers itself a “Student union for adults.” It is open from 7 a.m. to 3 p.m. each weekday and from 8 a.m. to 3 p.m. on the weekend. When you go, make sure to order the house Bloody Mary, which is a favorite drink of many regulars. The menu features fun takes on breakfast staples. The Croissant French Toast is a croissant dipped in an egg custard topped with a candied pecan topping. The Cuban Breakfast consists of a perfectly fried egg served over seasoned black beans, rice, cheddar, avocado, and sour cream topped with a spinach jalapeno sauce. Many diners love Cafe Patachou’s omelets where you can choose a flavorful house favorite, like the California Dreamer with avocado and jalapenos, or create your own. In Indy, Yolk refers to more than just the richest, most delicious part of an egg. Yolk is a tasty little restaurant located at 220 E South St. in Mile Square. It is open early on weekdays, from 6 a.m. to 3 p.m. and from 7 a.m. to 3 p.m. on the weekends. The restaurant is warm and welcoming, with brightly painted walls and a well-decorated interior. Although there is sometimes a line for brunch, it’s a fast line that’s well worth the wait. The restaurant really understands its command of sweet and savory dishes. Try the Red Velvet French Toast if you want to treat yourself to something decadent. If you want something hearty, order the Pot Roast Eggs Benedict. In many parts of the country, brunch has become the quintessential way to start your weekend day. Indy is no exception. With so many delicious brunch restaurants to explore, it is difficult to find just three to feature. Make an effort to try each one of these brunch spots to see which one is your favorite.